In recent years, no English cow has rivaled the record of Tilbrook Cashtiller 9th. From 2005 to 2009 she swept just about every show she entered. In all, she won 10 first place ribbons in national events and settled for second only twice. Cashtiller’s career in the ring was capped by being named Female of the Year two years in a row. The proverbial icing on the cake came the second year when she was named champion of the Royal Show…the first time a cow had won that honor in 15 years. We concede that Cashtiller is not, strictly speaking, a traditional English Devon, though her pedigree is spotless. First, her sire is Rotokawa 688, Ken McDowall’s famed bull from New Zealand. And second, she is a polled cow and a traditional Devon really should have been calved with horns. But we feel, along with her English judges, that she comes as close as we’ve seen to a perfect Devon and so we had to include her in our herd. 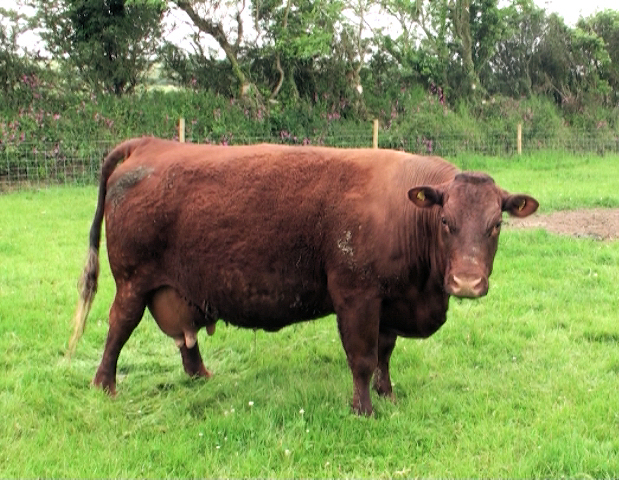 However, we will always make clear whether any of our Traditional Devon™ stock have polled genetics in their background. It’s important to note that, Cashtiller also has the habit of producing perfect calves. 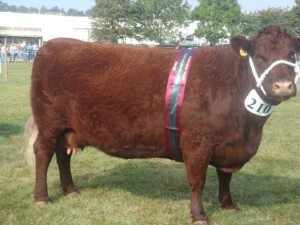 Two of her offspring have been the top selling bulls in the British Society sale in successive years. Next in line: a young bull with the appropriate name, “Hat Trick”. At this writing there are seven Cashtiller calves on the ground in the United States; five heifers and two bulls. Buttercup is one of those solid performers an owner can take for granted. But, even in a herd of prize-winning cows, she immediately stands out to a visitor. There’s always just a bit of separation, and her calves are to the outside, away from the herd, away from strangers. You sense Buttercup knows she’s special. There’s been Essington Buttercups on this pasture for decades and look at her pedigree and you will see a “Buttercup” in just about every generation. But never too close. Brian Drake doesn’t believe in line breeding. What he likes most about the Buttercups, he says, is that they are solid performers; a calf every year and one that turns heads. This Buttercup is noteworthy, according to Brian, for maintaining perfect body condition, never fat, through all the stages of pregnancy. He also likes Buttercup’s mobility. She’s an active cow and always first to the best grass. Buttercup’s sire is Essington Southern Comfort 2nd; and yes, there are Buttercups sprinkled through his pedigree, too. Ivan Rowe said “take your pick” and so we spent two full days going through his herd. But taking your pick is a tough job when you’re dealing with more than 100 perfectly-uniform Devon. And while we searched through the cows, we also searched through the pedigrees, and the English registry. We wanted to be sure we were choosing not only a beautiful Devon but one with a background that was unassailable. When we told Ivan we had decided on Norah, he smiled. 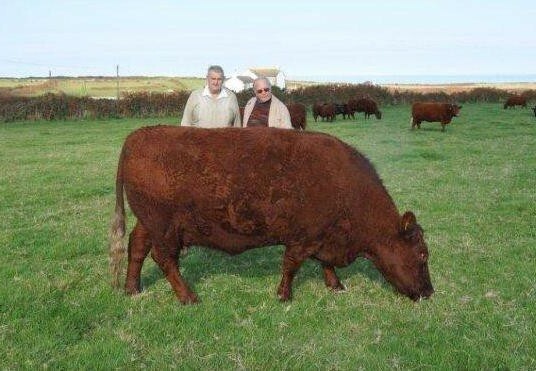 “You’ve got the most bullet-proof cow in the herd,” he said. He meant he felt Norah was flawless, not only in conformation and performance but in paperwork. And when a man who has worked with cows for almost 35 years and judged them for the British Society for more than a dozen, says “bullet-proof”, he speaks with authority. Norah calved at Goldings but she is descended from many of the great names in British Devon history: Clampit, Langworthy, Exbourn, Potheridge and many more. Her dam, Clampit Norah 150th, won every show in Cornwall in her time. Her sire’s dam won 39 championships around the country. Unfortunately, there was a downside for Norah, having been bred by Ivan. He felt, as a judge of cows and herds, it would be improper for him to enter his own animals in competition. 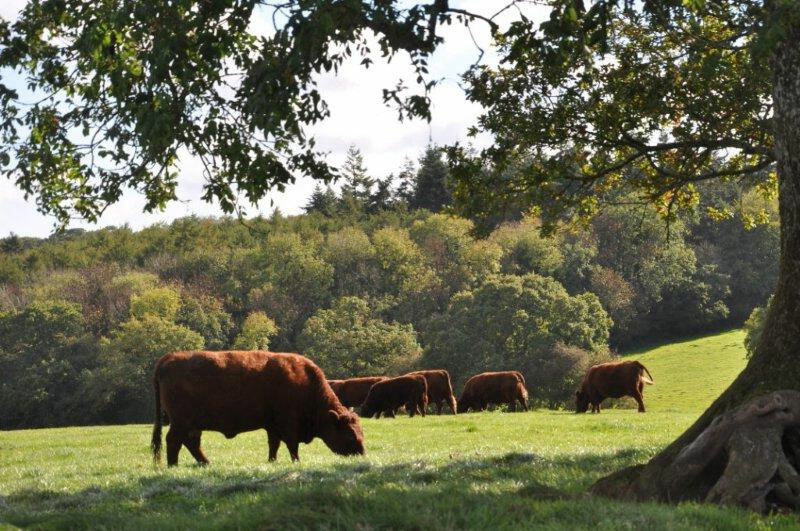 But, he (and we) feel there’s no doubt Norah ranks at the very top of pure, traditional English Devon! At the age of 14, Daffodil was the oldest cow we flushed for Traditional Devon™. Juliet and Chris Cleave were reluctant, as were we, but when it became clear she could not handle her last calf very long, the Cleaves changed their mind. Once the calf, which had been receiving supplementary milk, was transferred to a new dam, we brought her to the clinic. This picture was taken in the final minutes of Daffodil’s labor for what would prove to be her last baby. Daffodil’s pedigree contains almost every great name in British Devon history: Clampit, Champson, Brightley, Essington. The Cleaves decided such a rich heritage deserved a chance to live on in America. Unfortunately, despite special care and a long period of condition, we were able to net only two quality embryos from two flushes. At that point, we decided to end the effort. Those embryos are still in England, awaiting shipment. How we decide to handle them to improve our chances for success will be a story in itself.